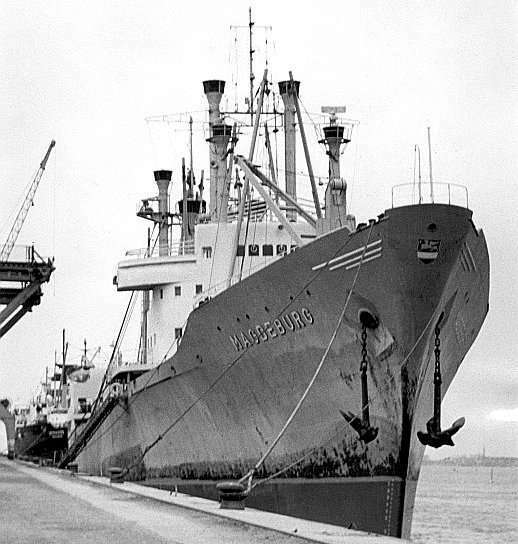 The Magdeburg being raised in 1965 (but Ian Boyd and David Stableford have both suggested that this picture is actually the Isabel-Flores). In 1964 the East German cargo ship M.V. Magdeburg was in collision with the Japanese ship Yamashiro Maru in the Thames near Tilbury. The Magdeburg was carrying 42 British Leyland Buses bound for Havana, Cuba. Mystery surrounds the sinking with links to the C.I.A. as the USA had a trade embargo with Cuba. I took this picture of the salvage operation in 1965 as the ship was being raised. It was taken from Gravesend and you can faintly see in the background Tilbury Fort and the Power Station. Jonathan Catton, Thurrock Heritage and Museum Officer has kindly supplied the following Fact File on the M.V. Magdeburg which makes interesting reading. On the 27th October 1964, in the biggest collision of the time since World War Two, the East German cargo vessel the M.V. Magdeburg was involved in a collision with Japanese vessel the Yamashiro Maru near the Grays side of the River Thames. The Magdeburg was steaming down the river from Dagenham with a cargo including 42 British Leyland buses bound for Havana, Cuba. The Yamashiro Maru was heading up-stream for the Royal Docks, when just off Broadness Point the vessels collided, the bows of the Japanese ship hitting the Magdeburg’s starboard side near the wheelhouse. The Magdeburg was badly holed and heeled over to one side and eventually it beached just off Broadness Point. On board the East German vessel there was a total of 54 crew including three stewardesses and also two passengers. During the collision one man was thrown into the river, but was picked up safely, and just two other persons were injured. Those on board used rope ladders to climb over the side to escape before the ship heeled right over, and were picked up by the tugs Hibernia and Dhula. The crew had a very lucky escape, the purser, Lothar Prause said “There were eight men on watch at the time, the rest were asleep. We were awakened by a terrific crash. We began to heel over and some of the cabins began to flood. The whole vessel was evacuated in 20 minutes.” Also Captain Frank Cable of the Hibernia had commented, “All the time the ship was moving further on to its side.” The Port Of London Authority stated that the collision in the Thames was the worst since World War Two and would be one of the most difficult wreck to move and salvage that they have encountered. The salvaging of the Magdeburg vessel (built in 1958 and weighed about 9,656 tonnes) was a complicated operation, after an unsuccessful attempt to upright the vessel failed in March 1965. Second attempts were carried out in July to finally upright and salvage the vessel. Every effort was made to ensure that this time the operation would be a success. The Port Of London’s Authorities Salvage Officer and his staff took part in discussions with the salvors and afforded what help was required. Two floating sheerlegs, a type of floating crane vessel, were used to help lift the vessel upright. Using four booms connected to the vessel, a series of wires were taken right under the sunken ship, round her keel to the opposite side of the hull where they were firmly fastened to one side of the vessel. The second attempt to up-right the Magdeburg took place on the 7th July. The lift commenced at low water and by high water the vessel had been righted to the extent of a 40-degree list compared to the 87½-degree list when she sank. From high water the ship was eventually righted to a 20-degree starboard list, the maximum righting possible because of the angle of the riverbed at this point. Ever since 1960, the U.S. Government had been putting an economic squeeze on Communist Cuba with what amounts to an unofficial trade embargo. Free world nations are urged not to do business with the Cuban President Fidel Castro, and all vessels dealing in Cuban trade were blacklisted from picking up U.S. Government financed cargo, leaving Castro almost totally dependent on his Iron Curtain friends. But in 1964, Great Britain knocked a hole in the embargo big enough to drive a bus through. In January 1964, in Havana, Britain’s Leyland Motor Co Ltd. Signed a deal to sell 400 heavy 45 passenger buses for $10 Million and also $1,100,000 worth of spare parts. The company gave Castro five years to pay, threw in an option for another 1,000 buses and agreed to train whatever mechanics were needed. To get around the shipping blacklist, Leyland first asked the British government for the loan of an aircraft carrier, when that request was ignored, the company announced that East German freighters would handle the order. But a British company supplying buses to Castro’s regime annoyed the U.S. government, but there was little that the Americans could do about it. Cuba needed to replace their existing bus fleet as they’re previously purchased buses from Skoda in Czechoslovakia fell victim to Cuba’s tropical weather, its potholed roads, and also hot-rodding drivers. Footnote: The Magdeburg was repaired in Tilbury Docks, and then made it’s first journey out to sea, but mysteriosly sank in the Atlantic Ocean. It is thought that the Captain was ‘got at’ and he scuttled the ship. I was the radio officer on the Central Electricity Generating Board collier MV Fulham IX. We sailed up the Thames on the morning after the collision. The Magdeburg was lying on its side against the south bank of the river. Two tugs were butted up against the ship’s bottom to prevent it from sliding down into the main channel and blocking access to the Port of London. The Japanese ship was anchored nearby with a large gash in its bow. It wasn’t until many years later that the story came out about the CIA involvement. It’s hard to believe that the CIA could influence or bribe the Thames River pilot and/or the Japanese ship owner to commit this act of sabotage. I too remember this incident and the balls being washed up on Grays beach. I was ten at the time and together with my brother Ian and next-door-neighbour Malcolm Neal we had our picture taken by and published in the Grays & Tilbury Gazette. We were pictured holding bananas if memory serves. The picture of the “Magdeburg” being raised by the “Yantlet’ is in fact the “Isobel Flores” which was sunk by a Turkish ship in Gravesend Reach, not the “Magdeburg” as stated. Broadness Point is a long way up river from Gravesend……. I remember the balls were plastic and had red and blue swirls of colour. My grandmother picked them up from Grays beach. All the kids seemed to have them. Thanks for the memory! George you might like to view my pictures of some of the buses in a yard in West Thurrock – here and here. You did not drive these away. Having read the story of the sinking and the salvage I would like to add this to it. it states that British Leyland wrote off the coaches as to salt damage. At the time I worked for a company in Kent who purchased some of the coaches by auction and sold them abroad although I can’t remember where. My point is there was nothing wrong with them after oil, water and fluid change I drove them from London to our yard in mid Kent although I will not reveal the addres, they had been cleaned inside and out and were in factory condition. I do remember that there were no seats fitted apart from the driver and that the spare wheel was strapped to the floor inside. I’ve no idea what happened to the rest of them as at the time every thing was very hush hush. I was a cadet at the HMS Worcester naval college (a large sailing ship moored on the south side of the Thames, (west Side at that location)) at Greenhithe, and remember that night very well. It was dense fog, we heard a lot of fog horns and commotion nearby as the ships collided not far from the college. We walked down from the college to the lighthouse on the point of the river where it turns towards Gravesend to view and take photos. Myself and other cadets were interviewed by Thames TV News but by then the police had cordoned off the bank.No news of the accident came out until the following week after interviewing the two captains and pilots. There was dispute as to where the accident actually happened but it was no more than 1000m from our moored ship. I was a 14 year old schoolboy at the time of the collision. Living in South Stifford, about a mile and a quarter from the river. Stop Press! I have just read on another site that the collision took place after 1 in the morning! I certainly would not have been watching television at that hour! T.V. used to shut down at about 11 I think! So much for my memory! I guess I must have been wakened out of sleep by the sound. The rest of my memory may be inaccurate, but I still have that sound in my head! If you go to transport -ships and docks you will see my photos of the Leyland buses at a yard at west thurrock an the shots of MAGDEBURG from the light house on the kent side. The power station was West Thurrock. I have photos of Magdeburg in dry dock to put on the site soon. I was a tug hand for Ship Towage at the time and often plastic balls of different sizes would float out of her. We would scope these up with a hand net and take them home for the kids. I am sure hundreds of balls landed up in Gravesend. I’d be very interested in getting hold of a copy of the photo of the salvage operation with Yantlet in the picture. I’d also be keen to hear from Roy Paton about his time on the Yantlet. I have a scale model of that ship which has been in my family since c1970 and I am keen to find out more about its working life and the folks who worked on it. the ship sank on broadness point. impossible to see from gravesend. the picture was taken from the shore near broadness lighthouse.the craft used to parbuckle the wreck were dutch craft called tak;lift one and two.capable of a lift of eight hundred tons each. if i remember correctly.the parbuckling woud have taken place toward high water.if it was low water the lifting craft themselves woud have been in danger of touching bottom. at the time i was deck-hand on the s/v yantlet, in picture.